This month we are shining a spotlight on the Charlotte Street Art Center and their annual Haunted House! Our vision statement is to “open the doors of creative expression to all“. That means removing barriers to opportunities in the arts so that everyone can have access to them. 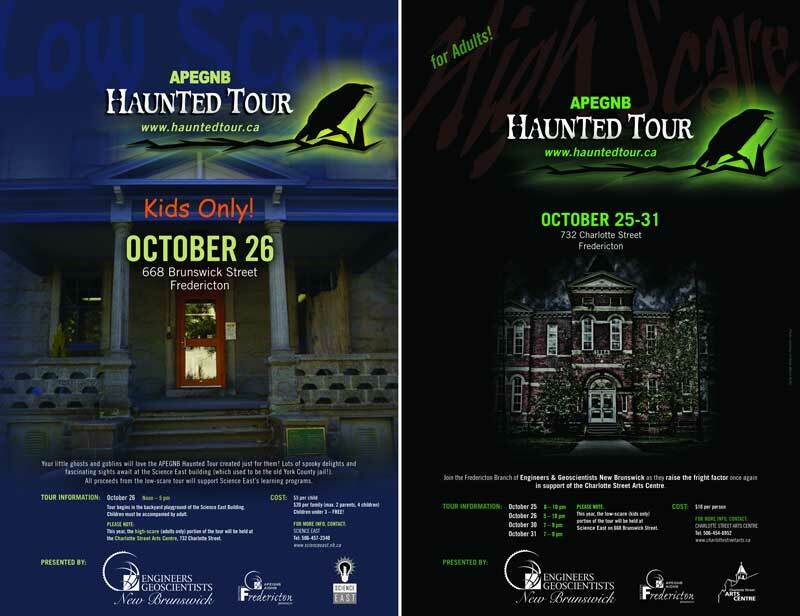 We do this by providing free educational programs to underprivileged groups, for one – that’s what the proceeds of the Haunted Tour go to support: our long-standing ArtReach program. Through ArtReach, we partner with a dozen other community organizations to open up arts programming to their (our) communities. 2) Do you have any big events coming up? 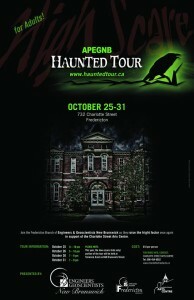 This year’s Haunted Tour is going to be much different from all the previous years. 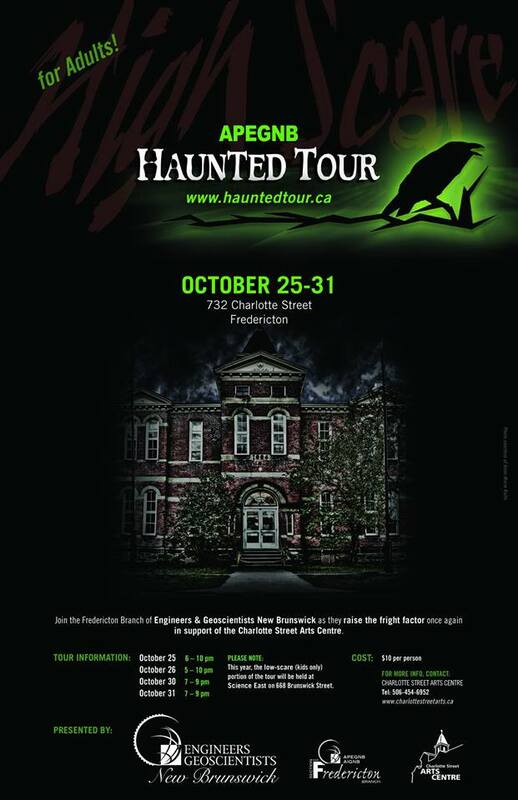 The LOW SCARE tours (for kids) are being moved to Science East, so the Charlotte Street Arts Centre is going to have four days of HIGH SCARE only tours (for adults). It’s going to be scarier than ever! Also, there’s a more streamlined path of horror for visitors, so wait times will be a lot less. The Association of Professional Engineers and Geoscientists of New Brunswick have worked really, really hard on offering this tour each year as a fundraiser for the Charlotte Street Arts Centre. Every year, they have more new ideas to ramp up the freak factor, and just keep outdoing themselves. 3) Can you tell us about the actors involved in this event? What you are looking forward to most about this year’s Haunted House? Yes, there will be actors but their identities will need to remain confidential….one of the other theatrical groups who will be participating this year is led by Judy Lavigne of Madrigal Players. Each night will have a little bit of a different theme…and there will be a weave of various performing artists entertaining throughout the evening. FYI – the Engineers APEGNB are the driving force behind this fundraising event. This year we are opening for 4 nights in order to keep the line up times down at this popular event. This year the tour path is different – the focus/design of the tour at the Charlotte Street Arts Centre is med-high scare, and the low scare for kids will be relocated to Science East. 4) What is it about Fredericton and the surrounding area that makes your mission so important? The mission to promote the arts – providing accessible and high quality programming is always important to the community. We have a vibrate creative community that we continue to nurture and celebrate. There’s no other place like the Charlotte Street Arts Centre in Fredericton and surrounding areas. We make art accessible to people who wouldn’t normally have access. We work to provide opportunities to marginalized communities, the elderly, youth-at-risk, women and children recovering from domestic abuse, and more. We hope to see the organization grow steadily, and plan to continue to strive for excellence in regards to facility and programming, in order to serve the needs of artists and the community. We’d really like to increase access to our facility by installing an adequate elevator. The single-person lift we currently have will only take one individual at a time from the first floor to the second floor in the front part of the building. Most of our events, the café, etc are all in the back part of the building and people with mobility challenges can’t partake. It’s our goal to keep working on this over the coming year and for as long as it takes until we achieve our goal.